A new loader mechanical bucket by Keech Australia is dramatically reducing the time required to replace edge wear systems on underground mine loaders. With the Keech Mechanical Bucket (KMB) featuring a complete bolt-on section at the front of the bucket, it differs from standard LHD (load, haul, dump) buckets on the market. The KMB has been put to trial at the Newcrest Cadia East gold mine in Orange, New South Wales, following a 12-month development phase. The mine is trialing a 12 cubic metre bucket with an Armourblade edge system on two underground mining loaders, and the results so far have been outstanding. “The KMB bucket front with the Keech Armourblade edge system can be replaced within three hours on site. Operators simply unbolt the front section and replace it with a new one,” said Mark Adams, Regional and Export Sales Manager for Keech. 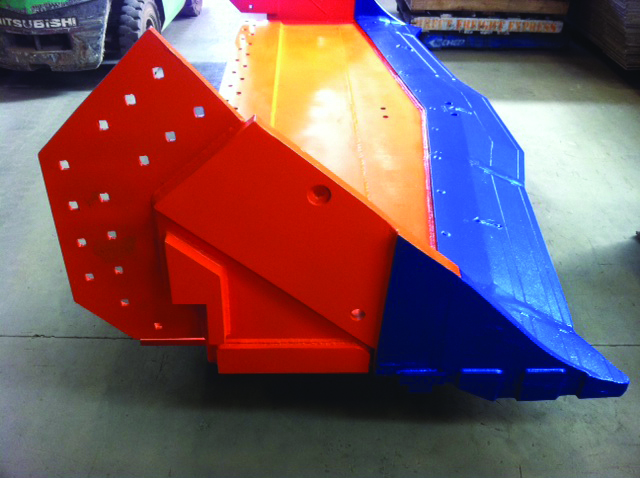 The ease of removal of the front section also means the bucket can run a welded edge, making it ideal for use in cautious areas such as crusher zones, while still maintaining a quick change out during underground operations to minimise downtime. The KMB is compatible with the Keech WearpactTM edge system or the Keech ArmourbladeTM system. Wearpact is a hammerless (GET) system, available in full spade and semi spade configuration, while Armourblade is a welded edge system specifically for use in underground loader applications. The Newcrest Cadia East trial is also evaluating actual edge life, which to date has tested at approximately 1,000 hours. “We’re currently investigating how we can extend this to 1,200 hours plus, and are looking at redesigning the corners, which are usually the fastest wearing area, through the addition of tungsten carbide inserts,” explained Mark. The buckets have been developed by Keech in conjunction with Canadian company Carriere Industrial Supply and are available in a range of sizes from 7 cubic metres right up to 12 cubic metres. They are manufactured from quench and temper steel, and Keech works with each customer individually to customise a wear protection system to suit the application at hand. The bucket is suitable for all scoop underground loaders.